Now ensconced on the smaller Eagle Rock label, Simple Minds actually managed to release a follow-up album to “Neon Lights” just six months afterward. The title track was released as a single prior to the album’s release. In what was swiftly becoming an endangered species, there were a pair of CD single, with differing B-sides released in Germany at the time. The A-side was an atypically lighter-waving bit of dance pop as cowritten with Italian DJs from his Italian home turf. The hook was tailor-made for fans performing “the wave” with lighters aloft. It was a tad cloying, and the inclusion of an incongruous soft-synth Hammond organ below the surface of the tune stuck out like a sore thumb. The next track, “Spaceface” was a track that Kerr had co-written with Sean Kelly of Oz band The Models. Presumably, the bands connected when Simple Minds had become hitmakers down under in 1981, but that marked Kelly as a more likely peer than the Italian DJs who figured elsewhere on this album. How exactly he re-connected with Kerr over 2o years later has not been divulged. “Spaceface” was released as a single in Germany on CD, and in a move that would be typical of this album phase, all of the many 12″ remix singles were released only to the Italian dance market. 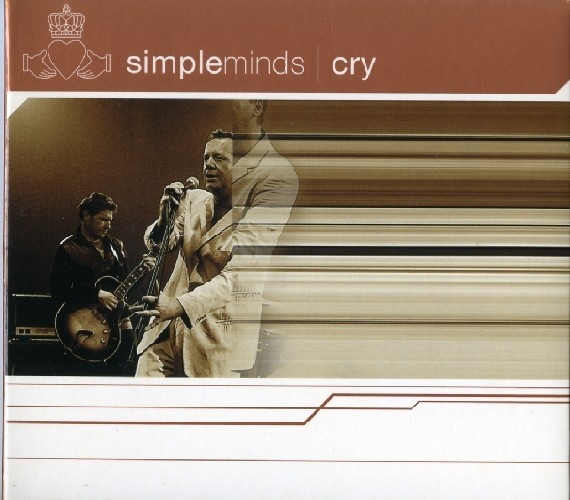 The Balkanization of Simple Minds that had begun with the “Homosapien” single on the last album really red-lined into high gear with the “Cry” album. I don’t have any of the single releases for this cut, since they were hard to get. That’s a pity, because “Spaceface” is a terrific song! The low-energy throb of the synth loops and eerie atmospheres harken back to the Berlin school of Krautrock, albeit imbued with the rock energy that Simple Minds usually brought to the table on such endeavors. Kerr’s vocals were firmly set in his comfort zone, which meant that the ragged, over emoting that marked the band’s stadium period was effectively banished, much to my pleasure. Cry,” but the results, while definitely in the euphoric pop side of the fence, managed to work more integrally with the Simple Minds sound. The result was an ebullient pop song that was yet another German CD single release from the band. This time, there would be no dance 12″ singles in any territories. The fourth track is my clear cut favorite for this album. 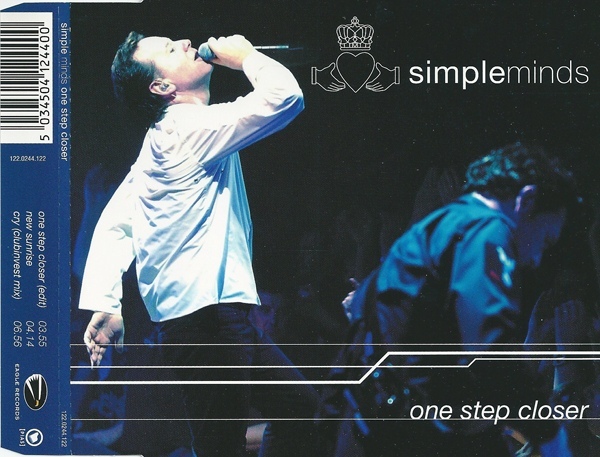 “One Step Closer” is a methodical, evenly paced number of quiet power that features some of the most appealing vocals from Jim Kerr in ages. The long buildup intro of over a minute and a half sets a mood of exploration that had been too long gone from this band’s bag of tricks. The Russian voice samples over the slow buildup harken back to the landscapes of “Empires + Dance” even as they embrace the club sound of the now. The track was co-written by Italian band Planet Funk and I really wish that there were more collaborations in the can between those two. The verses are built on a throbbing rhythm track that sees Kerr employing sprechtgesang vocals in a very appealing lower register voice that I had not heard from him in about 20 years. His vocals on the verses are treated with delay that lends his voice tremendous gravity even as the choruses have him singing more melodiously in a higher register. The cut’s length of over six minutes breezes by in what seems almost half that. 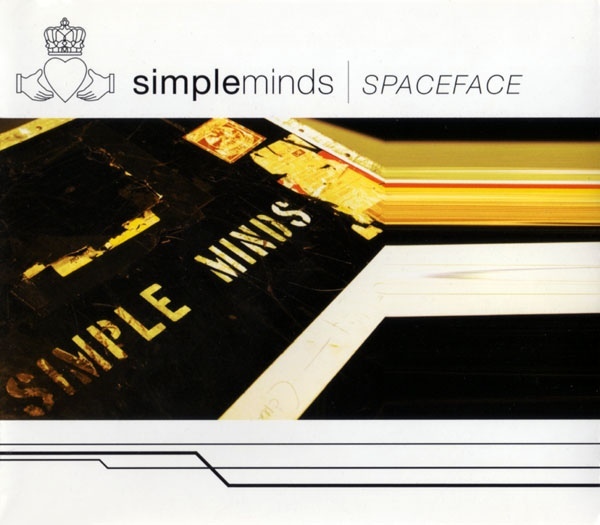 It’s a shame that this was only a single by Simple Minds in the Netherlands, but Planet Funk released it as a single in their name [featuring Simple Minds as blurbed on the cover snipe] in their native Italy the next year. Sadly, there were no extended remixes of this track on 12″ vinyl. Thus far, this has been an incredibly diverse, successful, and different Simple Minds album, that had me floating along effortlessly with its pop dance vibe. I suppose it was inevitable that there would be a comedown eventually. Such was “Face In The Sun,” a song written by Mark Kerr; Jim’s younger brother. In 2002, I had yet to hear “Our Secrets Are The Same,” so this was my first exposure to the deadly pen of the younger Kerr. In a harbinger of dread, the acoustic guitar that heralds this song; so out of place on this vibrant pop album, was played by Mark Kerr instead of Charlie Burchill. For all I know, Charlie was not even in the studio when this was committed to hard drive. The repulsive pseudo-folkie number features the absolutely worst singing by the elder Kerr I’d ever heard! The deleterious combination of its obnoxious lyrics coupled with the intensely smarmy vocal from Jim Kerr conspires to make this one to definitely skip when playing this album. Regurgitation is definitely a possibility at the 0:35 second mark! Adding insult to injury was the vinyl surface noise loop added pointlessly to the track. I can usually take or leave such techniques, but here it only make me more annoyed with this cut than I already was. How fortunate that the next track,”Disconnected” was a great technopop track for the first time in ages for this band. The track was the cream of the “Our Secrets Are The Same” sessions seeing it co-written with Kevin Hunter and Gordon Goudie. It towers over anything off of that album, and goes far in showing how important a good arrangement is for a pop song. Had this been recorded earlier, it might have been just as stultifying as on the previous album. This time Gordon Goudie’s nimble production gives this track a lift simply not possible on the stillborn 1998 album. The lyrics by Kerr hit the marks capably as well, making this one a lost opportunity as this album was bursting with single opportunities. As it was, the first four tracks from this album saw release as singles throughout Europe, and there are more winners in the second half of the album to follow. This entry was posted in Core Collection, Rock GPA, Scots Rock and tagged 2002, Cry, Rock GPA, Simple Minds. Bookmark the permalink. 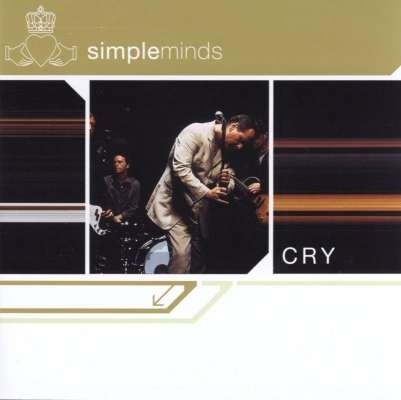 If listeners take nothing else from Cry, they need to absorb that Simple Minds were re-energized on this album. This is a new millennium Simple Minds, a band that didn’t so much need as want to record again. That they flirt with the dance rhythms of, the then, now is quite legitimate given that the disco floor accounted for some of their most important work 20 years earlier. Yes, the title track is pop music, pure and simple, but it’s engaging pop music to these ears and Kerr’s renewed vocal vigor is front and center. Spaceface takes all the indie/dance-isms of the time and filters them through Simple Minds musical generator to create a pulsing, edgy dance stormer. Burchill’s guitar plays in classic Simple Minds form over a driving, pulsing bass and drum rhythm. Kerr’s vocals are mixed right where they belong making for one of the most successfully mixed track of the prior 10 years. New Sunshine Morning is just gorgeous. If only the band had found this sound in the earlier in their career, they might have been able to sustain not only their chart placements as well as their listening base. Without the histrionics, Kerr’s plaintive, impassioned vocals sound heartfelt and serious. The almost ambient pop feel of the track is surprising in how well the band acquit themselves. I have to agree Monk, One Step Closer is the highlight of Cry. In another time and space this would have been a featured track on Empires And Dance. Twenty odd years on and with a lifetime of experience in their hands, they imbue the track with some of the emotional energy they’ve come to understand and mix in some of the travelogue forward motion they were once so spectacular at. Face The Sun is a fail. It has Balladeer Bowie written all over it. That Kerr recorded it and then allowed it on the album seems like it might have had more to do with the aborted Our Secrets Are The Same and much less with having any real place on this otherwise vibrant album. Disconnected is just wonderful. I feel as though the lyrics are very personal for Kerr. He seems to be saying he’s come to terms with the fact that he needs his part in music as much as music needs him. It’s a fairly complex track and Gordon Goudie proves his worth many times over on the production.